Šri Navagraha, the nine planets-seven of the solar system and two lunar nodes – are believed to influence and shape the lives of individuals as well as nations. Individuals also interact with the planets to accentuate or mitigate their influence. Especially during times of turmoil, the “Navagrahas” are invoked to nullify any negative influences. They have an important role to play in the lives of human beings. 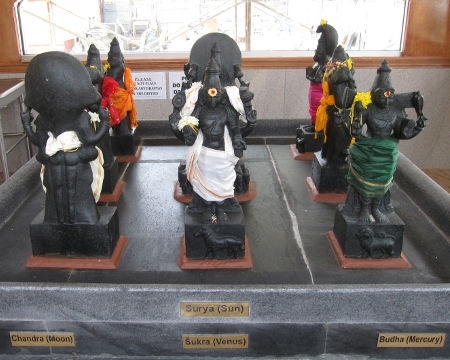 They are installed in Temples facing in set directions and in our Temple they are located outside the Maha Mantapam.